To try out the new lightweight ammunition and machine gun, a small group of Soldiers and members of the Army and Navy Senior Executive Service attended a live-fire demonstration in June at the Marine Corps Base in Quantico, Va.
Sgt. Jason Reed of the Soldier System Center in Natick, Mass., demonstrated firing both the LSAT LMG and the SAW from various positions -- from prone to kneeling to standing while in full combat protective equipment. “The difference between the two weapons is night and day,” Reed said. Despite the significantly reduced weight of the LSAT LMG and its ammo, there is no degradation in accuracy or lethality. In addition to significant weight savings, the LSAT is designed to provide other advantages over the current SAW. With a rotating chamber design, the cased telescoped light machine gun improves reliability. The chamber is unique in that the cartridge goes straight through from feed to eject. Additionally, the rotating-chamber design provides better heat management. Combined with the insulating properties of the plastic ammo cases the LSAT LMG has potential to decrease the possibility of a cook-off or eliminate them altogether. Another significant feature is the long-stroke, soft-recoil design, which provides a noticeable reduction in felt recoil over the current SAW. This significantly increases control, thus providing the shooter the ability to put more rounds on target and making the weapon much easier to fire from the standing position as a result of decreased muzzle rise. Moreover, the LSAT LMG has one other unique feature that the current SAW lacks: the ability to switch to a semi-automatic mode. This feature increases the flexibility of the weapon, allows for the precise engagement of point targets, and helps to conserve ammunition in situations where full-automatic fire may not be necessary or desired. In September, the weapon and ammunition will undergo a Military Utility Assessment that is intended to demonstrate the advantages that the LSAT LMG provides for the warfighter, as well as possibly influence the user community to develop a Capability Development Document, or CDD. A CDD is required before the system can transition to a program of record and enter the engineering and manufacturing development phase. 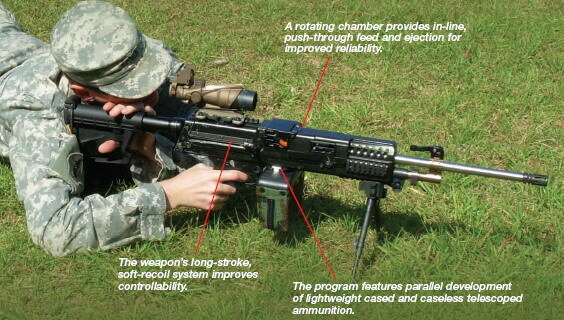 Nearly 20 Soldiers participated in a two-week assessment of a prototype light machine gun to demonstrate its potential impact on mission effectiveness and to help engineers develop possible improvements to the weapon and its unique ammunition. Immediately after each event, the Soldiers filled out surveys where they offered opinions about how they felt physically, and any issues or malfunctions they experienced with either weapon or its ammunition. They could also include any positive feedback.